A trip to St. Maarten-St. Martin allows you to discover two separate colonies occupying one small island of just 95 sq km (37 sq mi). Divided between France and the Netherlands, this tiny spit of land in the Caribbean treats visitors to a surprisingly diverse blend of native and European cultures. A tour of St. Maarten-St. Martin reveals a landscape of both urban and untamed areas, with sandy beaches and pristine rainforests often appearing as extensions of one another. The French north of the island offers a string of outstanding restaurants and lively beaches popular with a young party-loving crowd. The Dutch southern section lures visitors with its dynamic bar scene and casinos. Sint Maarten: The southern, Dutch part of the island, Sint Maarten boasts long beaches, good nightlife, inexpensive cost of living, and casino hotels--all of which make it a good starting point on your St. Maarten itinerary. Saint-Martin: The French part of the island has a genteel ambience, calm beaches, fashionable shopping options, and French cuisine influenced by the Caribbean atmosphere. Philipsburg: See historic forts, go shopping, or explore the long city beaches of Philipsburg, the principal town and the capital of the Dutch part of the island and an excellent starting point for your St. Maarten trip. Marigot: A great base to explore the French side of the island, Marigot features brightly colored houses and many sidewalk bistros. 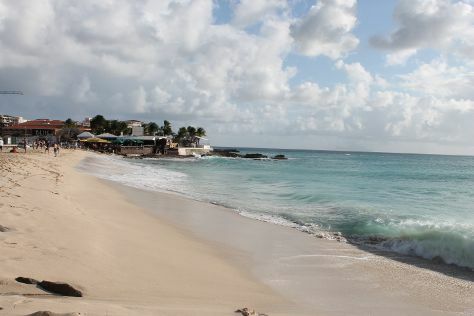 Orient Bay Beach: The island's most popular beach attracts visitors with its calm waters protected by a colorful coral reef--the wide white sands at the south end are often enjoyed by nudists on holiday in St. Maarten. Maho Beach: This urban beach provides an opportunity to swim, sunbathe, and enjoy close-up plane spotting--a nearby airport makes this spot anything but quiet. Pinel Island: A great snorkeling and kayaking spot, Pinel Island offers calm waters with abundant marine life and hikes along rugged trails encircling a sandy bay. Mullet Bay: A large white-sand beach, Mullet Bay offers slow-rolling waves kissing a crescent-shaped shore, with a rocky section that remains a very popular swimming and snorkeling spot. Frontstreet: Explore an array of stores and take advantage of duty-free shopping and numerous cafes and restaurants flanking this attractive street. Loterie Farm: In the foothills of the island's highest peak, Loterie Farm draws nature lovers and thrill seekers with hikes and three-canopy glides in a pristine tropical setting. Boardwalk: Mingle with the locals in this area, separating the beach from the restaurants, bars, and shops on the other side, and combine a perfect day of sun and sand with socializing on your St. Maarten vacation. The Butterfly Farm (La Ferme des Papillons): See butterfly specimens from all over the world at this tropical garden and learn about the world of these magnificent insects, which may land on you if they find your apparel colorful enough. Great Bay Beach: A walk away from the heart of Philipsburg, the city's longest beach offers wide white sands and views of the sea and passing cruisers. Yoda Guy Movie Exhibit: Meet the creator of many Hollywood special effects at a museum housing items used in numerous blockbusters, including "Star Wars" and "Superman." A good destination for a relaxing or active family vacation, St. Maarten offers plenty of places you can visit and enjoy with your kids. In Sint Maarten, the southern Dutch part of the island, kid-friendly beaches serve as quiet family retreats with calm waters and a number of activities to keep the youngsters busy. Families visiting Philipsburg can combine a visit to an urban beach with a stroll along a long boardwalk offering plenty of activities to keep everyone in your group happy. The French part of the island, Saint-Martin has great family-friendly restaurants, as well as a butterfly farm set in a tropical garden. Nature lovers on vacation in St. Maarten can also explore many kayaking, snorkeling, and hiking opportunities across the island. In St. Maarten, there are plenty of things to do for kids of all ages. Besides snorkeling, sailing, and swimming, coastal spots like Maho Beach allow you to watch low-flying airplanes preparing to land or take off from an adjacent airport. A great number of beaches like Dawn Beach and Great Bay Beach are suitable for kids, with calm waters good for swimming and wide sands ideal for lounging. Adrenaline-pumping outdoor adventures at Loterie Farm will thrill teenagers with ziplines connecting hundreds of trees. Toddlers may find the insects at The Butterfly Farm (La Ferme des Papillons) a bit more captivating. Kids into movies will enjoy Yoda Guy Movie Exhibit, established and operated by a man who created many iconic special effects and motion picture creatures. Pony rides and sailing lessons are available in many places across the island. During your St. Maarten trip, you may also want to bring your kids to a regatta or take them out to see one of island's numerous carnivals and festivals. An ideal St. Maarten holiday for a family would combine the best of the two parts of this dual-identity island. A morning on the Dutch-side beach with some seaside Caribbean food can be followed by an adventurous afternoon on the French side with ziplining or hiking. A dinner in the French section could then be followed with an evening of live music on the Dutch half of the island--basically, you want to mix it up and give both sides plenty of time, as each offers a unique experience and will contribute a slightly different flavor to your vacation. With its dual personality and over 100 nationalities, St. Maarten showcases diverse culinary traditions blending European, Caribbean, and African elements. Dubbed the culinary capital of the Caribbean, the island features French, West Indian, and Creole dishes, with some African and Indian recipes thrown in for good measure. Codfish appears in a range of popular meals, whether made as fritters or shredded in a vinaigrette. You can also spice up your St. Maarten holiday with traditionally prepared spare ribs or a "callaloo" soup made with pork cubes, hot peppers, onions, and "callaloo" leaves, similar to spinach. Creole spices and flavors cater to adventurous taste buds with a variety of stews and curries. The island is also home to eateries employing chefs trained in Europe, who make French and Italian-style specialties. Pair your food with excellent wine in the French part of the island, or with rum on the Dutch side. Guavaberry, produced from aged rum, and planter's punch, a rum cocktail with a variety of citrus juices, remain among the most popular drinks across the island. A big attraction in St. Maarten due its full duty-free status, shopping on the island makes a good addition to a beach-oriented holiday. Tourists looking for bargains during their St. Maarten holiday can pick up cosmetics, jewelry, liquors, cigars, and electronics at numerous boutiques and upscale shops along Frontstreet in Philipsburg. Souvenirs and local arts and crafts can be purchased in every town or beach resort. Local rum brands and CDs by various local musicians also make good souvenirs or gifts for someone back home. As you prepare to shop during your trip to St. Maarten, remember that the French part of the island uses the Euro as its currency, while the Dutch section uses the Netherlands Antillean guilder. Most merchants will also accept American dollars. Although locals have no problem with visitors wearing swimwear on the beach, walking around town or entering a local supermarket in swimming gear is considered disrespectful--the locals will have no problem letting you know how they feel about that. Do not underestimate the necessity for sunscreen during your St. Maarten trip--wear it whenever you go outdoors, or prepare to bring home an unpleasant sunburn. A popular tourist destination proud of its European and Caribbean heritages, St. Maarten runs a busy festival schedule. You can embellish your St. Maarten itinerary with at least one local event--home to over 100 nationalities, the island remains a great melting pot of cultures eager to show off their traditions. Celebrated at the same time on both sides of the island, the spring Carnival (February or March) is a big holiday and definitely worth adding to your schedule--explore both sections of the island to soak up those cultural differences and get the best of both worlds. The Regatta is a three-day boat race held in March--friendly competitions bring together sailors for some "Serious Fun." The Alliance Race is a similar event, only it takes place in November and starts from Simpson Bay. When greeting people during your St. Maarten holiday, a handshake will generally suffice. People you know on the Dutch side kiss will probably kiss you on the cheek three times, while the French-side residents will kiss twice. You'll find a few French phrases useful throughout your vacation, so learn a few basic sentences you can use to communicate with the locals--the attempt to communicate in a language other than English may win you a great deal of respect. Enjoying a tropical climate similar to other Caribbean islands, St. Maarten has the average annual temperature of 27 C (80.6 F), peaking at around 32 C (89.6 F). In the winter, temperatures rarely dip below 20 C (68 F), and in the summer average between 22 C and 32 C (72 F and 89 F). A popular tourist destination, St. Maarten boasts decent infrastructure, but the island's roads can get congested during the peak season. Driving a rental car may be your best option if you wish to explore both parts of the island. Car rental companies at the airport also offer motorcycles, scooters, and quads. Be aware that some rental companies in the Dutch section require you to keep your rented vehicle on the Dutch side of the island only. If you're looking for a more cost-efficient option and a chance to see the entire island without restrictions, you may want to rent a bicycle. Public transport system relies mostly on minivans, which you can flag down on most major roads. Most taxis on the island are unmetered, with fares significantly higher if you ride them after midnight. Tipping rules in St. Maarten-St. Martin differ depending on whether you are in the Dutch or the French part. The Dutch side follows the American style and usually doesn't include a service charge on the bill, while the French side follows European continental etiquette, with something called "service compris" added to the total. On the Dutch side, tip around 15 percent of the total if the service charge is not included. On the French side, it's customary to tip servers up to 10 percent. Taxi drivers, bellhops, and hotel cleaning staff depend on tips--consider giving about 15 percent of the total to cabbies, 1 USD per bag to hotel staff handling your baggage, and up to 5 USD per night per guest to your cleaning staff.